People who are currently working in analytics or eager to enter analytics industry usually have one thing in common which is ‘problem solving abilities’. After going through more than 100 hours of trainings on analytics tools and techniques, people still struggle to implement their knowledge to solve real time business problems. One such platform which offers problems with a handsome prize money is Kaggle. Every working professional in analytics industry aspires to win atleast one kaggle competition to get credibility in his business domain. But, a few succeed in making such brilliant accomplishments . One major reason for failure that we see is the lack of support in analytics community in India. 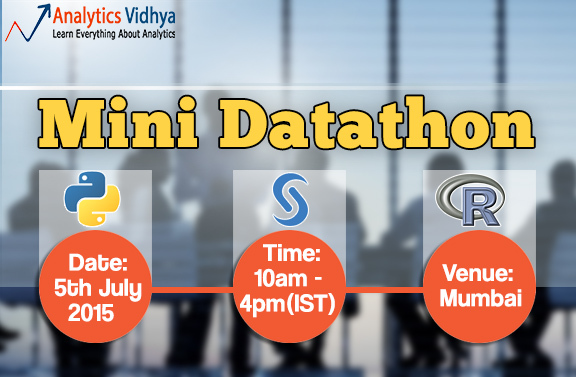 In order to bridge this gap, Analytics Vidhya proudly announces Mini Datathon where the brains of analytics will fight to solve a kaggle problem. Interesting part is, the people will get complete support of team of data scientists from Analytics Vidhya. This meetup will be hosted by Mr. Kunal Jain, CEO, Analytics Vidhya who also happens to be a Data Scientist, Growth Hacker. Who should join this meetup ? Anyone who is keen to learn analytics or has already stepped into analytics and wishes to upscale his/her knowledge and skills is welcome to join us. How much is the fees for this meetup? There is NO FEES for participating in this event. We believe that learning should not be obstructed due to financial commitments. Hence, you are invited. Food & Fun would be on the house. Please make sure you bring your laptop & your brain along! Why should you attend this meetup? 1. If you are eagerly waiting for an opportunity to compete with the best data analysts, data scientists and check your level of expertise, this can be an ideal platform for you. 2. If you are keen to solve kaggle competitions but have are struggling due to lack of guidance and mentorship, you should attend this. 3. If you wish to scale up your level of skills and competencies and wish to learn from the best data enthusiasts in the city, you should attend this. 4. Needless to say, if you want to meet and network with like minded people i.e. data analysts, data scientists, data managers, this can be an ideal platform for you. To participate in this meetup, Register Here. For more information & details on these meetups, feel free to drop us a mail at [email protected] or you can also reach us at 0124-4264086.